I feel like I’ve spent the last six years trying to get or being pregnant and now that I am DONE (that’s right, all caps), I’ve been slammed into a wall in the house that “time-consuming” and “give you the run-around” built when it comes to getting on birth control. Yeah, yeah, I know…hunky husband will say this topic is TMI but when have my blog posts been anything but? Your hormones get all wonky when you are pregnant then they get all wonky in the opposite direction when you have the baby. Factor in sleep deprivation, nursing (and for us working moms, pumping), and you essentially end up in a perpetual state of hormonal Wonky-ness. Anyway, the last thing my 40-year-old-just-getting-back-into-shape, sleep-deprived, trying-to-make-time-for-hubby bod needs right now, with a 3.5 year old and a 5-month old, is to get pregnant. With Fussypants, the return of you know what didn’t make an appearance until he was nine months old so you can imagine my surprise when I got it back when Little Miss was just four months. I admit, I believed the books when I read that you won’t get a period when nursing and since we always needed our fertility doctor’s help to get pregnant anyway, I just never gave birth control much thought. When that little dandy arrived, unexpected and early, the first phone call I made was to my OB/GYN. I had already decided on Mirena (after exhaustive, very-like-me amounts of research) and we got the process rolling. It’s covered 100% by my insurance, but the process requires one to have cultures done (which is an office visit), then wait for period to start the next month, and get a pregnancy blood test on day one (another office visit) then have it inserted on day three or four (another office visit). Because my hormones are all wonky, I was late. Eight days late, according to my calculations and don’t think I didn’t freak out. My doctor said that being late can happen after you have a baby, but suggested I take a pregnancy test to be sure. With shaking hands I did, it was negative, so I got the blood test done and this is where I got slammed into that wall. Apparently, even though Mirena is 100% covered by my insurance, it is considered a medical device, therefore not covered under my Pharmacy benefits, meaning I have to get it from my doctor. But my doctor no longer keeps it in stock because the price was doubled (went from $400 to $843.60 – I asked) so it is too expensive to keep on-hand. ALL things that should have been revealed to me prior to needing it right then (since there is a small window of time for placement), right? After several phone calls, mucho run-around and essentially getting nowhere, I admit defeat and this month is out. My doctor is trying to finagle a way to get it for me for next month, but nothing is guaranteed and yes, I will have to do the cultures and blood test over again…because I have time for three more office visits. I know there are other BC options but I am not interested in those for a variety of reasons. I suppose I could take the mini-pill, which is apparently safe for nursing moms, but it has to be taken at the same time every day to be effective and since most days I cannot recall if I put mascara on both eyes, I don’t see myself remembering to take a pill at the same time every day. So for the time-being, I remain BC-free and super wonky. 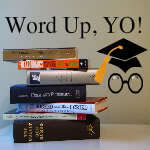 This post was written for the word game, Word Up, Yo! hosted by the self proclaimed Nerd Mafia: Natalie (Mommy of a Monster), Kristin (Taming Insanity) and Liz (a belle, a bean and a chicago dog). This week’s word is Wonky. I had the mirena and if I can at all dissuade you from getting it, please allow me. If you can go with the copper, non-hormone IUD. The mirena was aweful! I am looking at your not being able to get it a blessing in disguise for you! But if you are firm in having it good luck It's one benefit is never having to worry about birth control. Tehre is a post on my blog about the evil mirena or you can contact me and I'll tell you more about it. Dear BB, thank you for your comments and I will check out your blog. You are the only person, so far, who has negative things to say about Mirena, so I am interested to learn why it didn't work for you! Hmm, my first visit to your blog, and I'm already throwing advice around. I had some… interesting… experiences with Mirena as well. Feel free to email me if you're interested. Yikes, two strikes against! Please do elaborate. I have not been on any birth control aside from the "pull out and pray method" for 14 years as hubby and I had fertility issues getting pregnant so this is really my first foray into that realm. All advice is welcome. Natalie, I considered getting my tubes tied but when hubby balked at getting snipped, I figued that if I can't get him to do something permanent, then I don't want too either, just in case. I have four friends on Mirena, who have not had any issues, but I am happy to get both sides of the picture so I can make an informed choice!